The LPRCA in partnership with the United States Army Corps of Engineers (Corps) and the Nebraska Game and Parks Commission (NGPC) has developed a comprehensive recreation plan for the lower Platte River. The Lower Platte River Corridor is home to five of NGPC's top grossing parks and recreation areas. Additionally, NRDs, communities, and counties have developed parks, trails and boat access points. Through the development of the Recreation Plan for the Lower Platte River, we identified all recreation areas, facilities, and privately owned businesses such as outfitters and others. We also identified additional areas that could be developed into motorized or non-motorized boat access points, parks, and other recreational areas. The final piece of the plan identifies "time of travel" for paddlers under certain flow conditions as well as outlines the development of an interactive viewer and mobile app so that the information is easily accessible. The ultimate goal of this planning effort is the development of a formal "Water Trail" for the lower Platte River. Water Trails are common on rivers throughout the United States and certain trails are now recognized as "National Water Trails" for their natural significance as well as their developed features. We hope the Lower Platte River Water Trail will make the river more accessible to recreationists--paddlers, fishermen, and others--so that more people can experience the unique and scenic resources of the Platte River. An Advisory Committee has been formed and will be meeting periodically to discuss priorities, opportunities, needs, and concerns as seen by stakeholders from the National Park Service to Public Power Districts, outfitters, and land owners. At their last meeting, discussion was focused on introducing what the recreation plan includes and identifying important next steps. The need for an integrated website for the gauge readings from different organizations was brought forward. Opportunities for additional trails, access points, and mile markers were also discussed. Educational opportunities along the river, specifically in connection with the current abundance of hunting blinds, are seen as an important addition to current efforts. Advisory committee members were asked to identify key stakeholders and public and private groups to be involved in coming meetings, and key locations for near future efforts. Currently the Nebraska Game and Parks Commission operates an Interactive Trail Viewer that provides users to find maps and information for parks, recreation areas, access points and trails. Additionally the LPRCA Environmental Suitability Assessment viewer provides another information source for viewing recreation facilities, trails and other unique resources. We are also working with the Nebraska Game and Parks Commission as they expand their Venture Parks program along the Platte. We encourage you to check back regularly for more information and would love to hear from you about your recreation experiences or ideas. Please contact us with your questions, comments, ideas, or if you have an interest in helping implement the new recreation plan. 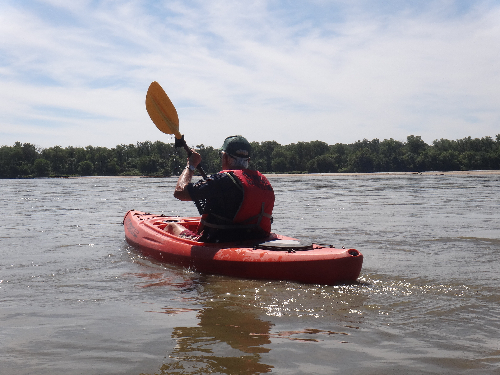 We hope to see all of you out on the river and enjoying the amazing recreational resources found within the last 103 river miles of the Platte River!